Lawrence Technological University has been named the national organizer for the United States for the World Robot Olympiad Association(WRO-USA), which runs a global LEGO robotics competition that draws participants from around the world. The Olympiad started in Singapore in 2004. This year over 17,000 teams are participating. Each country has its own competition, and the winning teams from each country are invited to attend the World Robot Olympiad to compete for gold, silver and bronze medals. 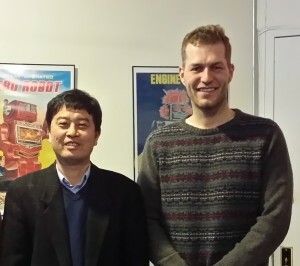 Lawrence Technological University Professor CJ Chung (L) recently met with World Robot Olympiad Association Secretary General Claus Ditlev Christensen of Denmark. This year’s finals competition is scheduled to be held in the Olympic city at Sochi in Russia Nov. 21-23. The event will be organized by the Ministry of Education, the Ministry of Industry, and the Ministry of Communication of the Russian Federation. Participants from over 36 countries – including the United States for the first time – will be offered accommodations in the Olympic Village hotels and apartments. Recently WRO Secretary General Claus Ditlev Christensen reached an agreement with Professor CJ Chung of Lawrence Tech to organize local tournaments throughout the United States and then hold a national finals competition where teams will be selected to represent the United States at Sochi. Chung said WRO-USA is looking for local tournament partners to organize local tournaments in different states between July and August. Organizations interested in becoming a tournament partner should contact robofest@LTU.edu. Team registration online has begun at http://wroboto.us. The USA national finals are scheduled to be held at Lawrence Tech on Saturday, Sept. 27. Chung, who teaches computer science at Lawrence Tech, was selected to lead WRO-USA because of his leadership role in LTU’s Robofest competition, which he founded in 2000. Robofest is a competition of autonomous robots – computer-programmed to act independently and not remote-controlled – that encourages primary and secondary school students to have fun while learning principles of science, technology, engineering, and math, known as the STEM subjects. This year Robofest has teams competing from 10 states and eight countries. Chung said WRO-USA should encourage even more American students to pursue their interest in STEM subjects. “Robotics is a game changer in many fields including education, since it provides true interdisciplinary hands-on STEM learning environment. The World Robot Olympiad will bring new playful learning fields to U.S. students,” Chung said. The WRO-USA 2014 competition’s main category is for elementary students only, and the name of this year’s game is “Rocket.” There are three age groups for the open categories that are like science fairs – elementary school, junior high (middle school) and high school. This year’s theme for the open categories is “Robots and Space,” and the task is to design and create robots that will assist humankind in solving tasks in space.